What will it take for Wellesley commuter rail stations to become accessible? Wellesley’s lucky to have 3 stops on the MBTA commuter rail line that runs between Framingham/Worcester and Boston, but if you’re in a wheelchair and want to board a train at one of Wellesley’s stations you’re pretty much out of luck. Meanwhile, there are accessible stations in West Natick, Framingham and Boston on the line that goes through Wellesley, and the nearby Needham stations are accessible, too. The accessibility issue came to our attention when Wellesley Assistant Executive Director Meghan Jop mentioned the lack of Americans with Disabilities Act (ADA) compliance at Wellesley Square’s commuter rail station (and the other Wellesley stations) at recent Board of Selectmen meetings while discussing a request for proposals to redevelop the Tailby and Railroad parking lots that sandwich the train. She suggested that any new development there could help to make the Wellesley Square platforms, at least, ADA compliant. ADA requirements are typically triggered by new construction or significant building/site upgrades. Jop also shared the gist of a message she received from a frustrated Wellesley resident whose son lives in Wellesley Square, but can’t get onto the trains because there’s no way for him to board them with his wheelchair. Jop says the Tailby/Railroad parking lot project could be a perfect opportunity to address the problem, and vowed to work to resolve the problem even if the Tailby/Railroad development doesn’t materialize. I followed up with the resident, Liz Fahey, who had sent email about her son William’s predicament to Jop after learning about the Tailby/Railroad lot plans. Fahey says she’s been making efforts since 2014 related to commuter rail accessibility, but really hasn’t gotten anywhere. For starters, she’d at least like to see a sign at the Wellesley stations alerting people to the fact they can’t get onto trains with wheelchairs. “I’m green with envy about what’s available in Needham,” she says, adding that the Yawkey station that would be her son’s destination for his job as a ticket taker for the Red Sox at Fenway Park is new and accessible. She’d settle for even a temporary platform to assist those in wheelchairs trying to get onto trains. Local officials, including State Rep. Alice Peisch, have been supportive, but also have struggled to make headway (Peisch says “the bottom line is funding” and is circling back with the T to see where things stand). 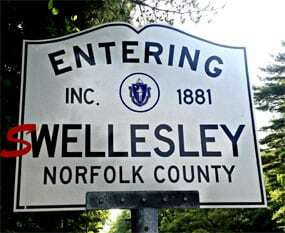 These local officials, and Fahey, acknowledge that a political campaign might be required to enact change at the Wellesley stations. This could involve starting a petition or getting those directly affected to band together in another way to get their voices heard. We’ve attempted to reach Keolis Commuter Services (operator/maintainer of the commuter rail system) and the MBTA in various ways, including via public relations, on social media and through a contact form on the T’s accessibility page. Keolis contacted us on Monday morning, though said because our questions largely focused on capital issues, the MBTA is the better source. Note that while Wellesley has responsibility for parking lot snow removal, maintenance and fee collection, Keolis/MBTA handles the platforms in town and is exempt from local zoning/permitting. The T has taken many steps to make its train, subway and bus stations — as well as is vehicles — more accessible across the state. Investments in commuter rail accessibility improvements are mentioned in the most recently published Capital Investment Program document. And as Josh Ostroff, chair of the Natick Transportation Advisory Committee pointed out in the comments section of this post, “the MBTA is taking a comprehensive look at accessibility on its entire system through a project called PATI, or Program for Accessible Transit Infrastructure. That looks at commuter rail and rapid transit stations and bus stops, and will help prioritize investments. This is run through the MBTA’s Office of System Wide Accessibility.” Interestingly, Natick funded an $80K feasibility study and conceptual design plan for the Natick Center commuter rail station back in 2012 that has resulted in the MBTA incorporating such plans into its investment initiatives. We’re not suggesting that Wellesley deserves to be next in line for improvements, as we understand the T has had ongoing financial problems and doesn’t have endless resources to put towards immediate accessibility upgrades. We’re just curious about whether Wellesley’s stations are on any sort of timeline for upgrades that T officials can share. Let us know in the comments section or by email ([email protected]) if you’d like to get involved or have ideas on how Wellesley can make progress on train platform accessibility. A few things that may be of help here. 1. The MBTA is taking a comprehensive look at accessibility on its entire system through a project called PATI, or Program for Accessible Transit Infrastructure. That looks at commuter rail and rapid transit stations and bus stops, and will help prioritize investments. This is run through the MBTA’s Office of System Wide Accessibility. 2. In Natick, we locally funded a $80,000 feasibility study and conceptual design for the Natick Center station in 2012. That produced a report in 2014, and helped lead to funding for redesign of the station in the MBTA/MassDOT Capital Investment Plan. That design process is now underway. Construction funding is not yet on the plan, which is updated each spring. Natick Center has the highest ridership of any CR station that is inaccessible. 3. The MBTA is planning for a third (express) track through Natick and Wellesley to accommodate passenger demand. That complicates station design. It’s a long-term plan but will dictate today’s decisions and designs. Glad to answer any questions about this – [email protected] is probably the best email to reach me, or 508 654-3330.